Welcome to the new HPV page! 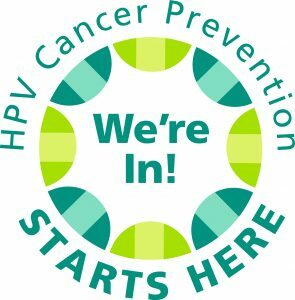 We are displaying the National HPV Vaccination Roundtable’s “We’re In” symbol to pledge our commitment to improving HPV immunization and reducing HPV related cancers throughout Virginia. For more information on the symbol and how you can join the cause, Click on the symbol. Here is a simple and easy resource to help determine if a patient needs a 2 or 3 dose series of HPV vaccine. Click here. Physicians, registered nurses and pharmacists you have the opportunity to earn 1 CE for FREE from The National AHEC Organization! 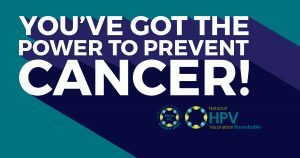 In 1 hour you will learn how to give an effective HPV vaccine recommendation to adolescents, successfully communicate with adolescents and their parents about the HPV vaccine, and receive up-to-date HPV vaccine, infection, and disease information you become the key to cancer prevention! Click here to learn cancer prevention strategies and earn FREE CE’s. Did you know that the human papillomavirus (HPV) can cause oropharyngeal cancer? Click HERE for a guide about HPV and oral health.